This was definitely one of the most exciting trade deadlines ever. A ton of stuff happened, and a lot of fantasy-relevant were affected. Most likely, I'll have an article up in the next 48 hours involving all of these trades. The waiver wire has plenty of gems available because of everything that went down. All players on this list are owned in under 40% of Yahoo! leagues. With a few exceptions, previous listed players will not appear. Alfred Morris (40% owned) - It's close enough, right? Ezekiel Elliott was suspended for the hundredth time Monday night for six games. I have no clue what's happening in-court and frankly I don't care to know. Adam Schefter and other sources reestablished that Elliott's suspension was for real this time. So, it's time to pick up Zeke's backup. It's Alfred Morris. He would always get the carries when Elliott needed a break, and Jerry Jones announced today that Morris was the team's #1 back. The Cowboys' offensive line is up there with the best of them, meaning anybody who sees carries can do something. Morris is the man to own down in Texas. Alex Collins (37% owned) - I've definitely mentioned Collins before, but it's been a few weeks. You might've forgotten because it was Thursday night, but Alex Collins rushed for over 130 yards and Coach Harbaugh said today that Collins has definitely earned more touches. At least until Danny Woodhead comes back, Collins figures to earn the majority of touches. He gets Tennessee this week. As an Alfred Morris owner, Collins is my #1 waiver wire add this week. Paul Richardson (34% owned) - Almost every time I watch Paul Richardson, he's hauling in a 50/50 jump ball for a huge gain or a touchdown. Richardson has scored at least 10 PPR points in 6 of 7 games this year, which is surprisingly something not a lot of wide receivers can say. He's heating up like the entire Seattle offense with touchdowns in back to back games. With plenty of fantasy-relevant receivers, Richardson is a solid dart throw play with game-winning upside. Robby Anderson (29% owned) - Quietly, Robby Anderson has been balling in the Big Apple. He has over 9 fantasy points in 5 of his last 6 games, including at least 12 in 4 of those 6 games. Anderson's better than people give him credit for, outperforming T.Y. Hilton , Alshon Jeffery , and Devin Funchess. Not a bad PPR play if you've got players injured or on their byes. Josh McCown (25% owned) - Josh McCown has more fantasy points per game than the following players; Jameis Winston, Matt Ryan, Derek Carr, Phillip Rivers, and Marcus Mariota. Notice a theme among those players? All of them are owned in at least 85% of Yahoo! leagues. McCown's also heating up. He has at least 17 points in four straight games, including over 27 points in two of the four games. Buffalo is a tough pass defense, but McCown managed 15 fantasy points against them Week 1 and he's vastly improved since then. 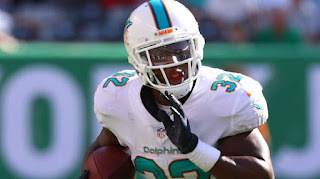 Kenyan Drake (4% owned) - Unless you live under a rock, you saw what happened in Miami today. Jay Ajayi was traded to the Philadelphia Eagles for a fourth round pick. That leaves Kenyan Drake and Damien Williams to man the Miami backfield for the rest of the year. The Dolphins' organization haven't come out and said anything about who the starter would be, but Miami Dolphin beat writer Omar Kelly tweeted today that when Ajayi missed practice, Kenyan Drake got first-team reps and didn't disappoint. He's the more talented option between he and Williams. Ajayi couldn't get anything going all year so I don't expect much out of Drake or Williams, but starting (or possibly starting) running backs should never be left on waivers. Arizona Cardinals (37% owned) - The Cardinals defense have not been the elite unit we expected them to be this year. The secondary, outside of Patrick Peterson, is a mess and they aren't generating much of a pass rush. However, they play San Francisco this week! Jimmy Garoppolo most likely will not play this week after being traded yesterday, leaving CJ Beathard to control the offense. He gets sacked a ton and is really bad. Last time Arizona played San Francisco, SF failed to reach the end zone and threw an interception. Take advantage.